WHAT DOES CNC MEAN ? CNC means Computer Numerical Control. This means a computer converts the design produced by Computer Aided Design software (CAD), into numbers. The numbers can be considered to be the coordinates of a graph and they control the movement of the cutter. In this way the computer controls the cutting and shaping of the material. The way coordinates are used can be seen opposite. The X, Y and Z axis control the movement of the cutter on a 3D CNC machine. This allows materials to be machined in three directions (3D manufacture). The plastic block shown below has been shaped on a CNC machine. It started as a cube. The design (produced on CAD, Computer Aided Design software) has been converted into coordinates. The cutter is instructed to go from one coordinate to another. A simple plastic block such as this may have a thousand coordinates. For example, point ‘A’ on the plastic block has coordinates 18, 8, 23 (see diagram). The block is composed of thousands of coordinates and the cutter goes from the first set of coordinates to the second set to the third set and so on, until it has completed the thousand coordinates. As the cutter is spinning at high speed, and travels through all the sets of coordinates, it cuts and shapes the block, as it goes along. 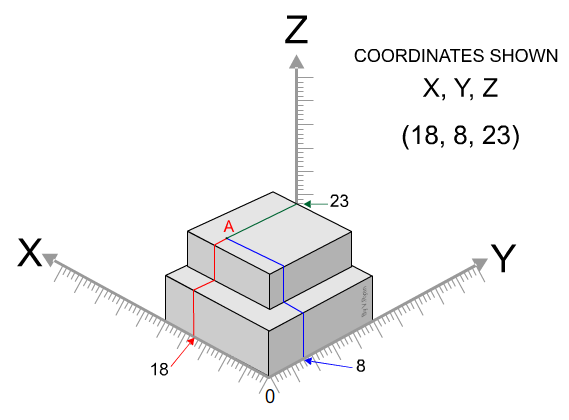 The animation below shows how the coordinates change as the cutter moves across the block of material. 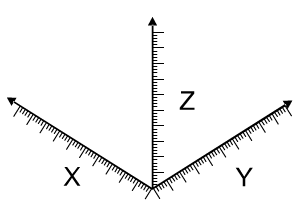 The 'Z' coordinate does not chnage as the cutter remins at the same height, despites its movement on the X and Y axis.